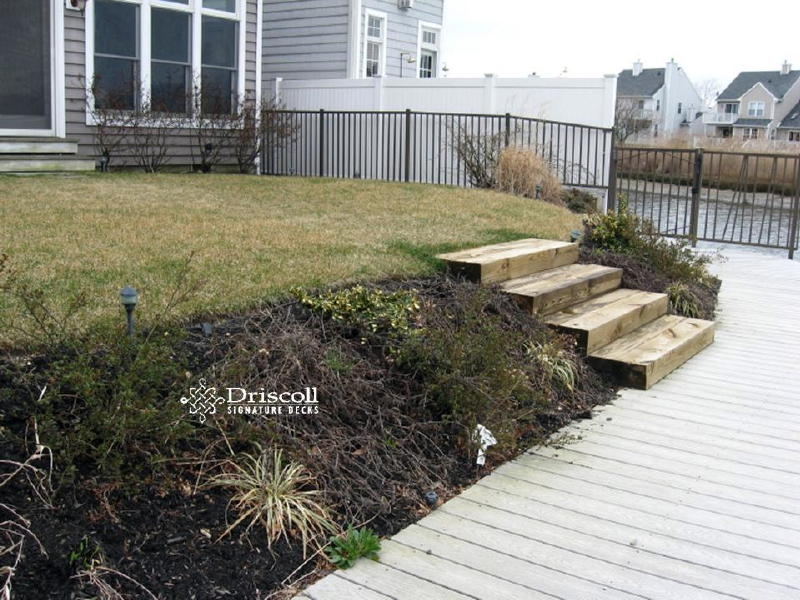 This Driscoll Solution Story starts with these Ocean City Decks and is a bi-Level waterfront with picture-framed decking board patterns, with accent lighting on the level changes, stairs & posts, plus paverstone walls, and a stone walkway around to the front of the house, and a separate paverstone barbeque platform. This lovely dockside home had a beautiful million dollar setting, but before it could be enjoyed, it needed some serious Driscoll Magic..! So the Quinn family knew to search to find Driscoll Decks. We then came to visit for a site survey, to take all the measurements, and discuss their family needs for a new custom deck: what size, location of dining table, grill, sunbathing area. Once we had the overall deck needs down we began to develop what we refer to as DeckPlan_v1 and follow up with as many versions as needed, even if we get to DeckPlan_v6 or more are needed. Our goal is to get it right on paper first! 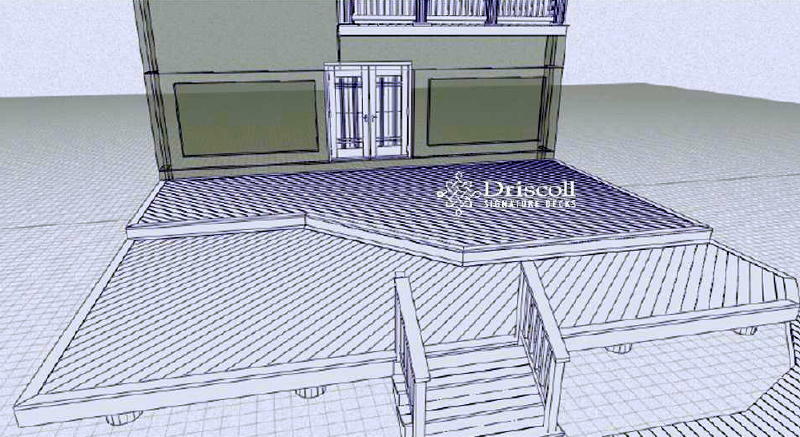 Through a little trail & error, we developed this Perfect Driscoll Deck Design which called for a good sized upper walkout level with plenty of room for lounge chairs, to an angular step-down large waterfront section. The barbeque grill is not shown here but will be on a paverstone platform on the right side to the height of the upper deck, near the dinning area. 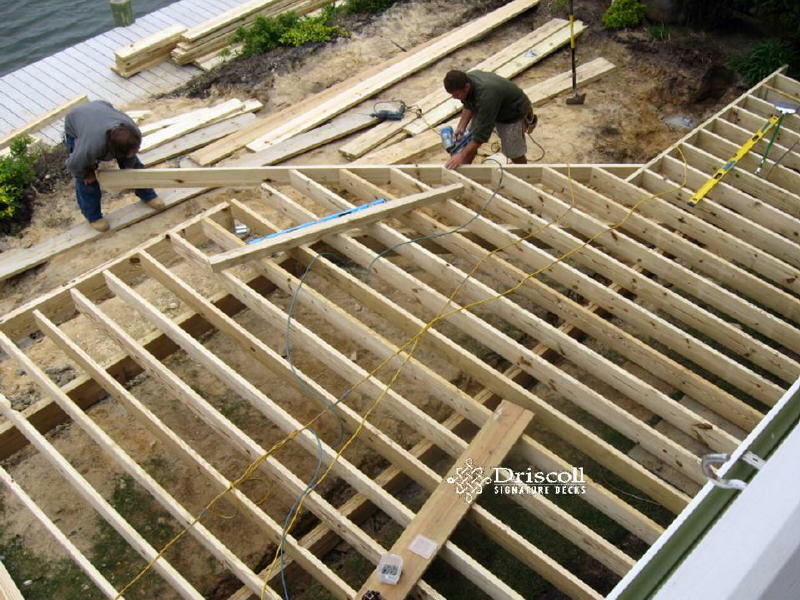 The first order of business to make this fabulous deck plan work is to install Driscoll robust deck framing with 2×8 joist at 12″oc. As, you can see, this is the upper level framing, as we begin to build the angles for the step-down to the lower section. Note the 2×8 material on the slopping grade and on the gray dock, which will all be part of the lower section and the paverstone walls. Don’t you love it when a great plan comes together. Please note the doorway centered parting board with the 45 degree angled pattern on the left and the straight across perpendicular decking boards to the right side of the center parting board. You will also note that we changed the direction of decking board patterns to accent the v-shaped level changes for not only esthetical reasons but also for safety so that the direction change becomes more visible to the eye. 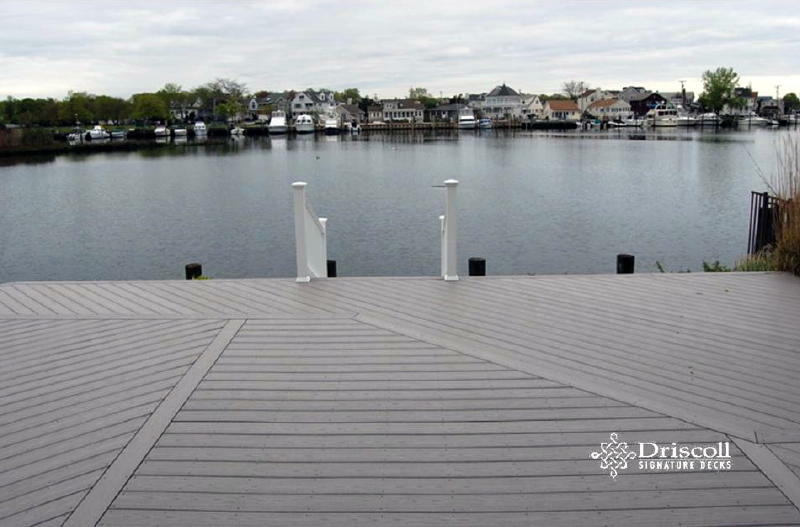 As you can see, this cellular vinyl deck did not require railings along the dock based on the building code with a top of deck (TOD) of less than 30″ from the grade below, but did require the white vinyl stair with the railings showing here because the drop was more than 16″ or two (2) 8″ risers. The actual TOD from the dock was 22 1/2″ so we used three (3) 7 1/2″ riser/treads on these stairs. 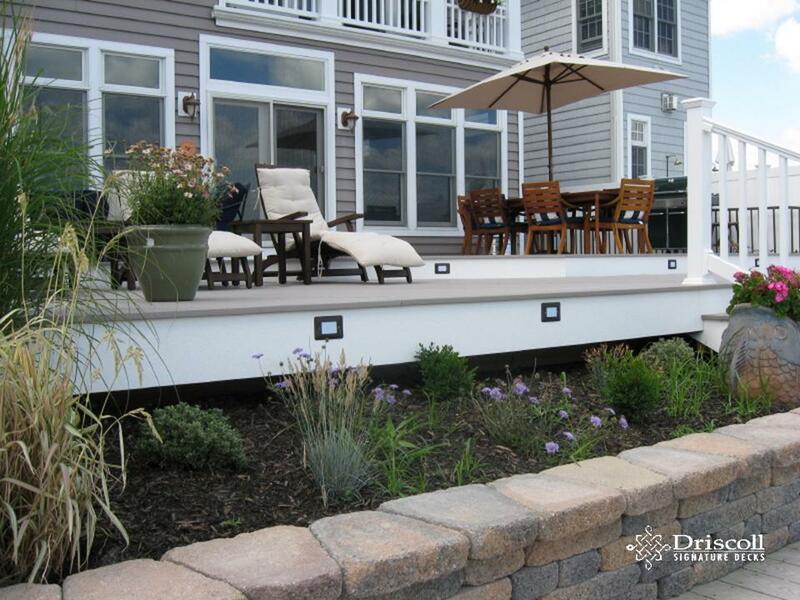 This fabulous deck also included lovo accent lighting on the level changes, stairs and rail posts. The hardscape block wall runs along the dock, then the paverstone walkways run alongside the house to the front driveway. We also included a paverstone barbeque bumpout at the deck height, to set the grill area aside and save valuable deck space. 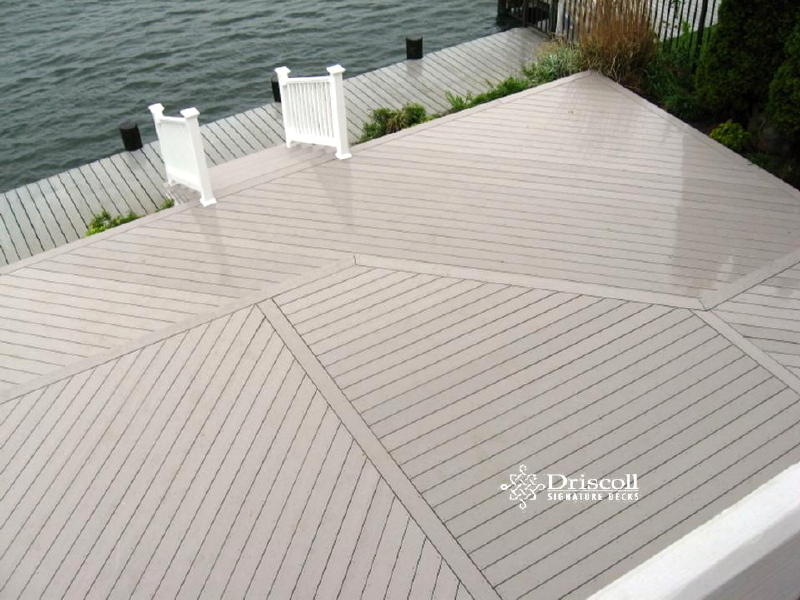 Another fabulous Deck Designs Ocean City.